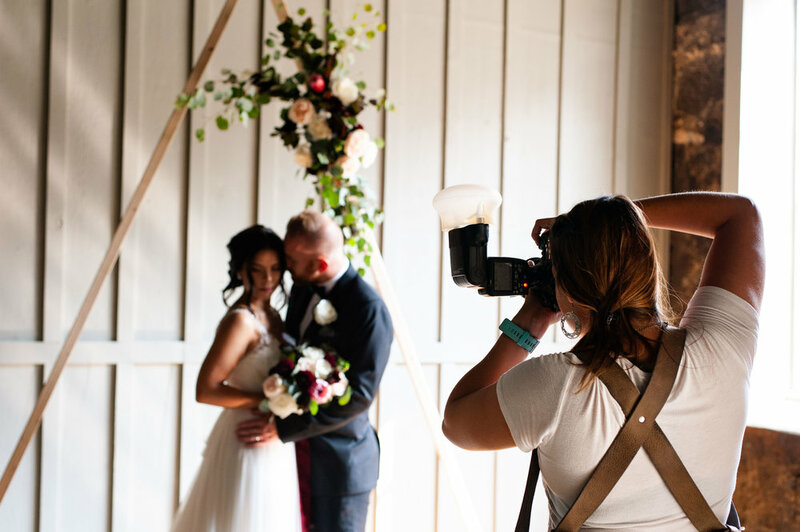 Katherine Callahan (Katherine Elizabeth Photography) is a wedding and portrait photographer who simultaneously creates a story while making you feel like you are chatting with a friend. When we met in 2016 she was working at a non-profit and photographing weddings, families and portraits on the weekends. As of early 2017 she is a full-time photographer, shooting 15-20 weddings a year in the greater Baltimore and DC region. Her work is full of intimate moments on some of the most important days of people’s lives. She shares an honest and candid look into her life through Instagram where she shares everything from training for a marathon to the importance of mental health to her recent road trip through western Canada and the United States. Katherine’s photography journey began at age 12 with a love of National Geographic where she discovered that a captured moment could propel you through time and space. During high school she had the opportunity to shadow and assist a wedding photographer and took some classes in black and white photography. She left Maryland for Texas, where she went to college and interned at a production company learning the value of people as a basis for storytelling, met and married her husband Kyle, and thought life was taking her on a different path away from photography. Back in Maryland she picked up the camera again after an 11 year break and that love of storytelling through image came rushing back. She began asking friends and family if she could shoot their portraits and began second-shooting weddings with other, established, photographers. 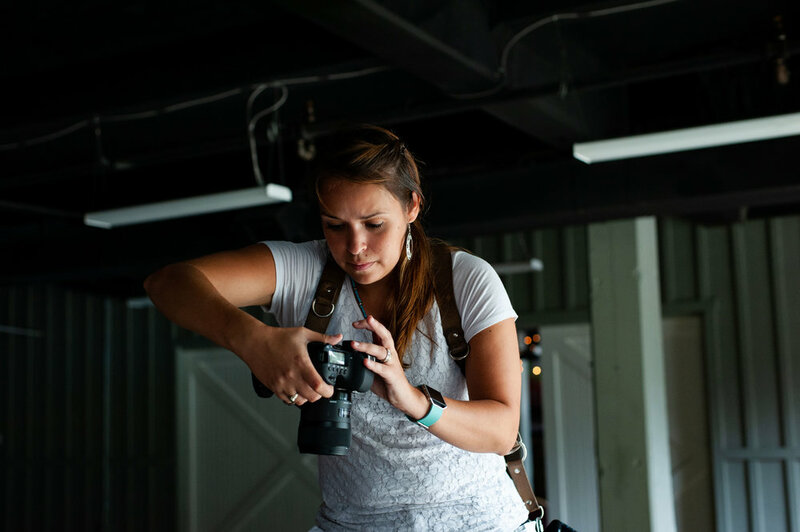 One of the most formative experiences came in 2016 when she interned with Ellicott City-based photographer Kate Ann Morris to really see what it takes to run a successful business and convince herself that it was possible to make this a career. During intense wedding season, fall and late spring, Katherine can shoot up to 3 weddings on the weekend, either as the prime or a second shooter, and deliver portrait sessions during the week. On a non-wedding day, her day begins the night before by planning out the tasks she wants to accomplish that day and writing them down in Trello, a business management platform, where she can create lists of workflows, link documents, and determine what tasks she might need to outsource. The exact tasks vary day by day. A typical Monday after a wedding may include culling the thousands of photos she has taken to send a few out to the client as a sneak peak, checking in with other clients and preparing blog posts. Mornings are dedicated to business-related tasks, since editing can be a long and laborious pursuit that is hard to pull away from, and she tries to batch tasks - blogging several sessions at the same time for example - to help keep her flow. Routine is important for self employment and she begins each day with a devotional app on her phone and then lots of coffee. 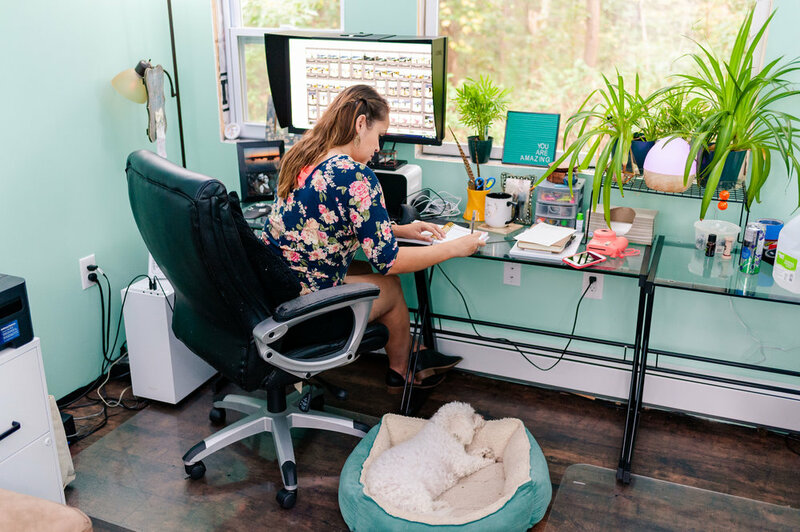 Her two dogs, Pepper and Rice, keep her company in the backyard office build by her husband and father-in-law. She considers herself an “over-consumer of information” and listens to over 100 audio books a year while she works. One of the ways Katherine challenges herself and tries new techniques is by partnering with other wedding professionals for styled shoots. This summer she did a “Much Ado About Nothing” theme at the Main Street Ballroom in Ellicott City with S.D. Events, sister-owned wedding planners, where she can make connections with different wedding vendors and create a portfolio of work to submit for publication. Wedding days are a marathon (and she would know, having run one this past April!) so Katherine tries to ensure a good night sleep, breakfast and lots of water since breaks tend to be few. The day before she reviews and packs all her gear - two or more cameras, multiple lenses, LOTS of batteries, flashes, stands, props - and prints out the timeline of the wedding day and list of formal family portraits. 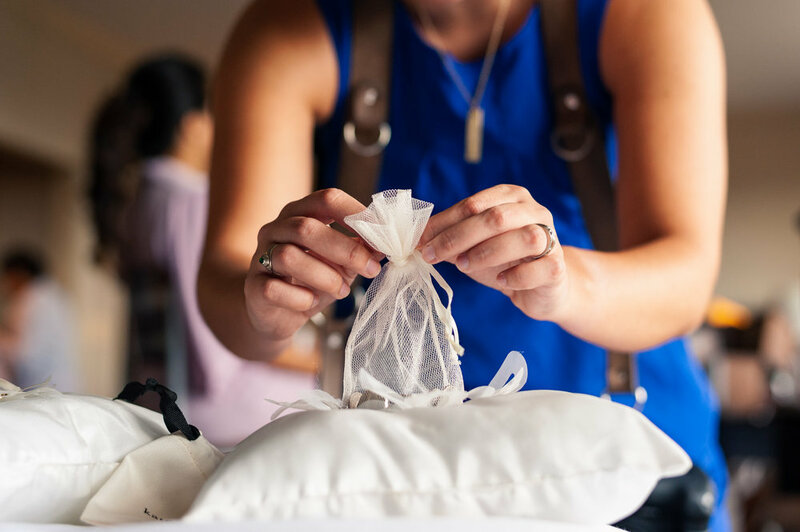 A month before the wedding she checks in with the couple and sends them a questionnaire with details about the day such as locations, bridal party, specific photos, and venue policies. She always tries to arrive to the venue 30 minutes early to give herself time to scope out portrait locations, determine where the best light is, and review key locations for photos. Then she checks in with the bride to say hello and get updated of any changes that may have occurred before starting to photograph important details of the day like flowers, rings and mementos. Once those are done she gets some candid getting ready photos of the bride and any bridesmaids or family. Depending on the couple, they may do first look photos before the ceremony or some group photos with the bridesmaids. If a second shooter has been hired, they may photograph the groom getting ready at the same time. Keeping her eye on the schedule, the bridal party gets hidden away a half hour before guests arrive or the ceremony begins. During this time she checks on any restrictions for shooting during the ceremony and gets details of the venue or candids of guests. As soon as the ceremony is over, family formals begin, which can be up to dozens of family and extended family members, depending on the clients, and showcases Katherine’s talent for patience, directing, and sociability. Then it’s time for couples portraits, for which she says her job is a balance between getting the photographs and keeping them relaxed, especially if it’s a hot day. The reception timeline is generally dictated by the DJ, so she is sure to keep open communication, but tries to stack events towards the start of the reception, depending on how long she is booked. During dinner she will take a bit of a break, “no one likes a photo while eating,” but keeps mindful of locations and light so if she sees something like a gorgeous sunset she can pull the couple aside for a few additional portraits but also lets them know that they can call it quits if they are ready. Once the dancing begins watch out for Katherine to jump in on the Wobble and show everyone how it’s done as she dances her way across the floor for candids. As her time comes to an end she will check in with the couple once more to see if they have any final requests. Heading home she’s often feeling ready to hit the club, still charged with the energy of the night, or sink exhausted into a bath. As soon as she gets home she downloads all the images (several thousand) from her memory cards onto a cloud based system and then finally calls it a night. One of the challenges Katherine faced in running a business was the reality that she only spends about 10% of her time actually photographing. She noted that people often start a business because it is something they love or are good at but don’t realize everything else that goes along with it - you can be a great photographer but a poor businessperson and fail. She has had to spend a lot of time figuring out workflows and systems. Most people don’t understand that it can take 40-50 hours of work outside of the 8 hours shooting a wedding, and that disconnect can lead to sticker shock at the cost of a photographer. Another challenge is the lack of regular personal interaction. Katherine describes herself as an extroverted introvert and it can be difficult spending all day in her own head with no one else giving you instruction or collaborating with you. She has learned to get more comfortable with feedback and learning where her strengths and weaknesses lie to improve in the areas she feels she may not excel in. She wonders where she would be if there hadn’t been an 11 year gap between doing wedding photography and often feels late to the game, but reminds herself that her journey has been for a reason and the life lessons she has learned along the way have made her a stronger person and professional. Katherine is extremely grateful for the opportunities she has had and the people who have helped her along the way. She notes the first person who asked her to second shoot for him back in 2014 and her internship with Kate as some of the biggest pushes to launch this career. Despite only being in full-time business for less than two years, she has already hit several unexpected milestones, like having an elopement published in Baltimore Bride. Of course, the couples and families she gets to work with are the biggest highlight - she considers getting to see their excitement and to be part of their lives both an honor and a blessing. Thank you Katherine for allowing me to spend this time with you and to see behind the camera! To see Katherine’s work and book her for a shoot, visit her website: Katherine Elizabeth Photography. You can also check her out on Instagram or Facebook. Check out more posts from my Day in the Life series!